About this Pet Litter Scoop:Paw shaped scoop. Long handle is perfect for cleaning the cat box.Special Instructions:Rush service: 1-color/1-position required. Item color assortments are not available. About this Pet Food ScoopN Clip:Easily dig out pet food with this large paw shaped scoop. Tightly seals pet food bags. Features 1 cup size to help manage portions.Special Instructions:Rush service: 1-color/1-position required. Item color assortments are not available. About this Small Scoop - It Bowl:Smart combo scoop and bowl. Small bowl is ideal size for cats and small dogs. 10 oz. capacity.Special Instructions:Rush service: 1-color/1-position required. Item color assortments are not available. About this Medium Scoop - It Bowl:Smart combo scoop and bowl. Medium bowl is ideal size larger dogs. 15 oz. capacity.Special Instructions:Rush service: 1-color/1-position required. Item color assortments are not available. About this Caribiner 2 Bag Dispenser:Features a refillable compartment with 20 biodegradable disposable bags (sized 8 3/4" W x 12 1/2" H). Fits most store purchased bag refills. Easily attaches to a leash or belt loop with carabiner.Special Instructions:Rush service: 1-color/1-position required. Item color assortments are not available. 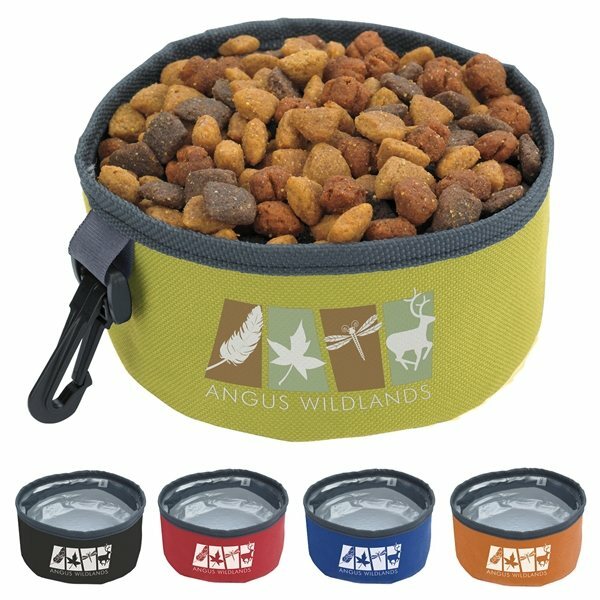 About this Perky Pet Travel Bowl:Folds compact with hook & loop closure for easy storage. Clip easily attaches to a leash, backpack or belt buckle. 600D polyester construction holds up to 24 oz. of dry food only.Special Instructions:Rush service: 1-color/1-position required. Item color assortments are not available. About this H2o - To - Go Bowl:Collapsible pet bowl for the on-the-go pet lifestyle. 3 cup, 24 oz. capacity. Includes aluminum carabiner. Easy to carry with large imprint on side panel will ensure your brand is visible with every step. Snaps in closed position around leash or clipped to pack for easy transportation. Sealed PVC construction will ensure leak-free use. FDA approved material.Special Instructions:Rush service: 1-color/1-position required. Item color assortments are not available. About this Poopy Pet Bag Dispenser:Contructed of 70D. Features a refillable compartment with 20 biodegradable disposable bags (sized 8 3/4" W x 12 1/2" H). 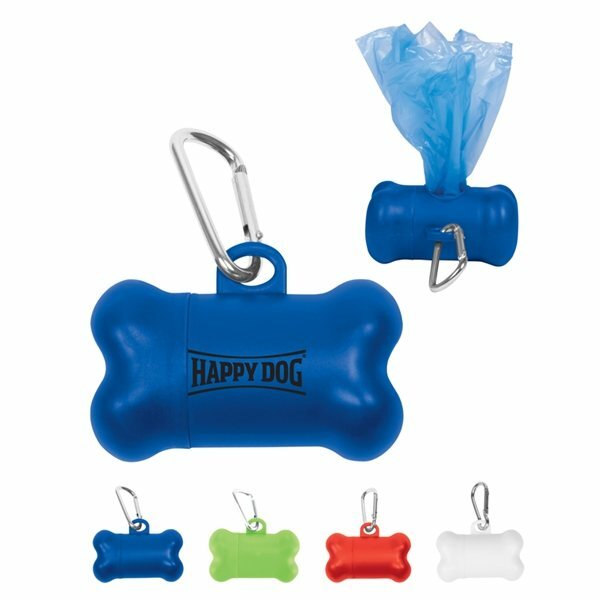 Plastic clip attaches to any backpack, belt loop or leash. About this Pet Collapsi - Bowl(TM):4" diameter soft flexible silicone bowl. 8 oz. capacity. Collapses flat for easy storage. Carabiner attaches to a leash, belt loop or backpack. About this Dirty Diaper Bag Dispenser:70D nylon construction. Includes 20 biodegradable, plastic disposable bags (sized 8 3/4" W x 12 1/2" H). Plastic swivel clip. Discrete way to dispose dirty diapers when you are on the go.